Rachel Maddow Archives - Page 10 of 20 - Joe.My.God. This is how it went down live on MSNBC during the vote. Plus coverage of Gaga’s rally in Maine yesterday. Truth Wins Out founder Wayne Besen appeared on Rachel Maddow last night to discuss Delaware GOP Senate candidate Christine O’Donnell and the “ex-gay” movement. Plus lots more about O’Donnell’s whackadoodle past. Calling DADT “absolutely mindless,” Vice President Joe Biden tells Rachel Maddow that he is confident Democrats came overcome any GOP filibuster of the defense authorization bill to which the repeal of DADT is attached. I missed posting this yesterday, but on Tuesday night Rachel Maddow laid into Christine “No Jerking Off” O’Donnell, the teabagger Senate candidate from Delaware. “It’s OK to be a moderate Republican.” Great interview. Well, that was a few trillion well spent. Thanks, Dubya. 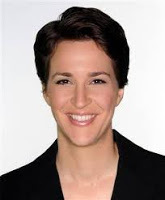 Maddow On DADT: Why Aren’t We Holding Off On The Ruination Of Careers? Last night Rachel Maddow devoted nearly her entire show to the repeal of DADT, interviewing several of its most high-profile victims, including Lt. Colonel Victor Fehrenbach, who has just filed suit to stop his dismissal. Here’s how Maddow closed out the show. And how he’s tied to the Christian rock band that calls for the execution of homosexuals. In her inimitable style, Rachel Maddow breaks down how the “work” of Dr. George “Rentboy” Rekers played a role in today’s ruling. Watch and enjoy!